Though it was his direction that led to the LPGA tournament photo, Hanson let Hayward snap the picture that became a two-page spread in Sports Illustrated. Hanson, who died of a heart attack at 41 while playing hockey in March, sometimes came across as gruff—cursing at Hayward, riding up to the Governor General’s residence on his Harley and giving Parliament Hill staffers hell for denying photographers access to politicians—but the cowboy persona was only his first layer. “He seemed like a Maurice ‘Mom’ Boucher,” says CP’s Montreal news editor Alex Panetta, referring to the former president of the Hells Angels’ Montreal chapter, “but he really had the disposition of a Shakespeare.” It was these sides Hanson tapped into when taking photos, with his hard-nosed approach and his discerning eye coming together to capture the human side of Canadian history. CP’s Ottawa bureau hired Hanson full-time in 1992. 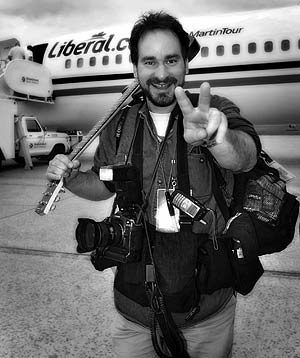 He went on to win several awards, including NPAC’s 2001 Picture of the Year for a photo he took at the Summit of the Americas. Fred Chartrand, Hanson’s mentor and long-time CP colleague, remembers him coming in from the protests reeking of tear gas, but excited about one particular shot: it showed a gas mask-wearing bagpiper with water-cannoned protesters behind him. Everyone else was just as excited, including the newspapers that picked it up. But protest shots weren’t the only ones Hanson was after. He was always determined to bring home the Canadian angle of any event he covered. Hanson shot the 2000 Sydney Olympics with Remiorz and Kevin Frayer, and stood at the highest position possible in the crowd during the opening ceremonies. The three heard the athletes were going to unfurl a massive Canadian flag, so Hanson was perfectly placed when they did—except the flag was turned the wrong way for his shot. Hanson called the chef de mission and screamed at him, “The flag’s upside down! The flag’s upside down! Tell them to turn it around!” The flag slowly turned to face Hanson, giving him his Canadian angle.